Next Wednesday, May 13, Bronx Defenders Executive Director Robin Steinberg, on behalf of The Bronx Defenders, will accept the honor of “Courageous Social Activist” from the Child Welfare Organizing Project (CWOP). 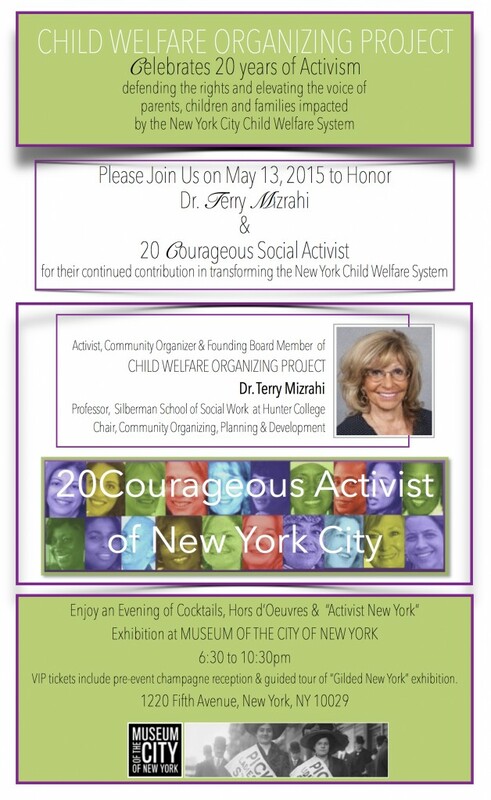 As CWOP celebrates 20 Years of Activism next week, they will be honoring Dr. Terry Mizrahi, professor at Hunter School of Social Work and a founder and long-time board member of CWOP, as well as 20 women who have worked to support mothers and families in the child welfare system. The Bronx Defenders, being honored for our work representing parents in Bronx Family Court and for our ongoing fight for justice, is proud to be part of this group of courageous social activists.